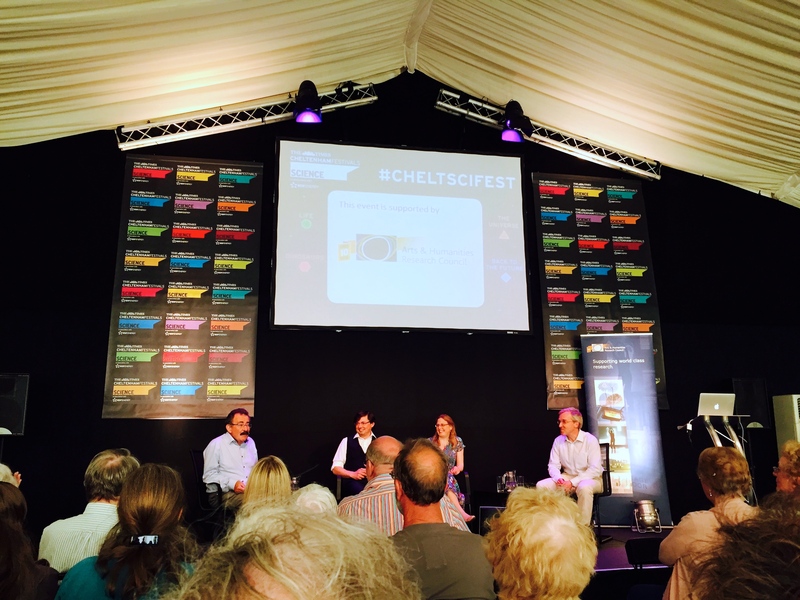 It was a enormous privilege to represent the AHRC at the Cheltenham Science Festival. From the first application to take the Ordered Universe project to the Festival, to the intensive media and presentation workshop at Polaris House, and then to working with the AHRC and Festival co-ordinators, it has been an exciting and supportive journey. The session we presented, ‘Robert Grosseteste: The Greatest Scientist You’ve Never Heard Of…’, started with Tom introducing Grosseteste’s physics of light, and the impact of this on his cosmology, especially in the treatise On Light, the De luce. 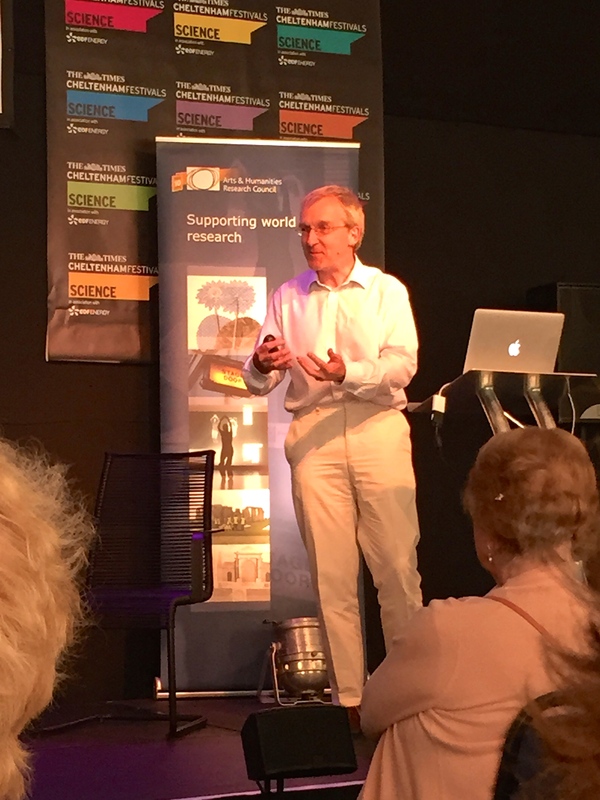 The Cheltenham audience were extremely receptive: when Tom outlined the creation of the medieval universe from a single point of light, expanding spherically….in its eerie echoing of the Big Bang you could see the audience lean forward. How Grosseteste deals with the problems of matter and its extension, and develops a unified theory for the universe were equally striking aspects his thought to present. The mathematical translation of the De luce was something very special to offer the audience. Giles then took the baton, giving an outline of what we know about Grosseteste’s career, where the scientific texts fit in, and some of the issues involved in why Grosseteste the scientist is less well known than he should be. How the Ordered Universe project works, our process of collaborative reading, writing and research took centre stage. To explain how the various disciplines come together, to form a multi-disciplinary team, with inter-disciplinary outputs, is to the relive the process. Trust, respect and a real willingness to listen and think about the material presented and the problem to be solved are at the heart of the project’s methodology. The ways in which the collaboration makes us better medievalists and better scientists and how the team moves from manuscript to edition to translation to interpretation was delightful to share with the audience. Taking the final presentation was Hannah, with a wonderful exposition of how Grosseteste deploys his own theory of colour outlined in the treatise De colore, in his treatise on the rainbow, the De iride. More than this, she outlined how it was possible to follow Grosseteste’s lead, to work through this application of colour theory and to model the family of natural rainbows for the first time. Another forward movement of the audience came when Hannah started showing Grosseteste’s essentially 3Dimensional model for colour: two qualities of the medium, four qualities of light, in six combinations (purum-impurm; multa-pauca; clara-obsucra). The resonance with modern theories of colour perception was, and remains, striking. A very lively question and answer session followed, expertly chaired by Professor Robert Winston. An excellent range of questions, from human visual perception, to Grosseteste’s inheritance of Islamic and Jewish thinking, how to distinguish different types of colour in pre-industrial societies, whether Grosseteste was a realist or not, how his religious thinking drew on his scientific thinking (or did not), how modern models of colour perception work, and many more. 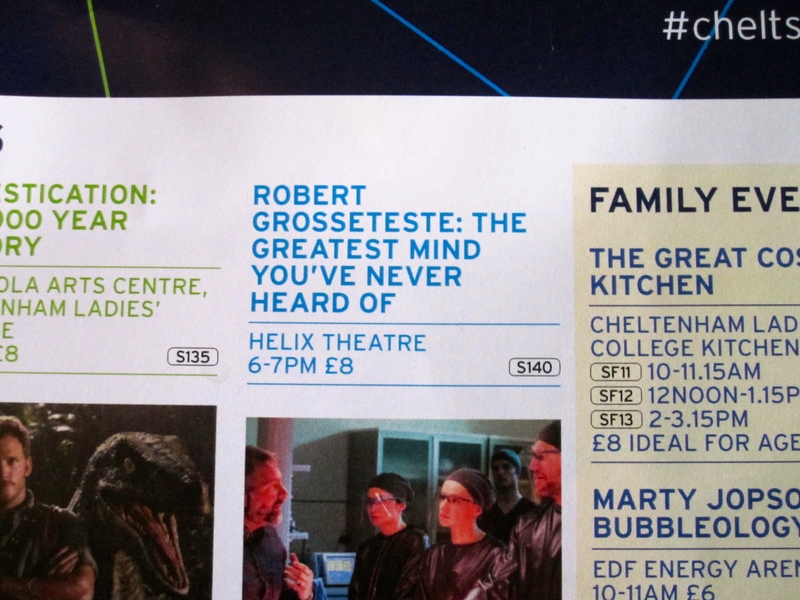 What else would you expect from a Cheltenham audience! It was a thoroughly enjoyable experience, to a packed Helix Theatre, and a real thrill to present the importance of science in culture, culture in science, and the value, as well as the joy, of collaboration.